Instagram Video - Is it the end of young Vine? When Vine was launched in the beginning of 2013, it caused a huge comotion among the social media lovers. Sharing videos of 6 seconds in Twitter and Facebook? Well, that's a new way of showing people that funny trick your cat does or how you can put a whole slice of pizza in your mouth at once. And we are not even starting on the potencial of this app for maketing. 6 full seconds of a brand video, looping non-stop while you scroll through your feed? Genius. In a couple of months, Vine became the most used video-sharing application in the market. On April 2013, Vine became the number one most downloaded free app within the iOS App Store. In the end, it is nothing more than "make your own gif and share it". It is silly but lovable. However, something happened in the Facebook HQ... They were getting jealous of all the attention Vine was getting and decided to launch Instagram Videos (remember Facebook bought Instagram last year?). You know when somebody takes a good idea and make it great? That's what they did. 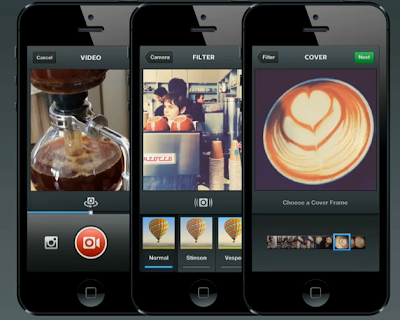 Instagram Video has many features Vine lacks: 13 filters, delete last clip of edition, choice of cover frame, shareable by email, Flickr, Tumblr and image stabilization. With more than double time of Vine, 15 seconds of video, you can show how you fit the whole slice of pizza in your mouth AND your friends laughing at you. Not to mention that you didn't need to download another app, the new feature just appeared in everybody's Instagram in the last update. On the marketing side, many brands have millions of followers on Instagram, a short video might be the perfect way to introduce that new product or service. Or maybe a sneak-peak of the office? On the other hand, Vine has the gif-looping-feeling that is very popular and it's embedabble. It also lets you mute the video (on desktop) and has no buffering, it is click and go. But the real question is: does de video fits Instagram? Is it going to make the famous app lose its identity? The show-off with thousands of followers love it sure, but some are complaining it makes Instagram something it is not and still prefere Vine to share videos in Twitter or Facebook only. Local Businesses can be great partners in achieving a good social digital strategy. An interesting local brand is good content in the first place. By mentioning them and letting that business know of your article will probably convince them to share the article on their own websites, social networks, and other media. This gives you access to a wider audience AND perhaps untargetted network. Also, your social image is benefitted as you put forward a local outlet. Below is a case study on Le Général Hôtel blogging about La Boutique des Saveurs. Thinglink is a platform which can amplify your hotel's visiblity on the internet in various ways. The following slides demonstrate an example of how it used in the context of Le Quartier Bery Square Hôtel's overall digital markeitng. The platform allows the hotelier to select an image and link it to all types of other social media platforms such as classical accounts (i.e. Facebook, Google +Hotel Le Quartier Bercy - Square , Youtube etc...) to more unconventional media such as social playlists (eg. Spotify). A big advantage to thinglink is that sharing the image is user-friendly, keywords can be easily integrated, and the interaction with the visual creates a memorable and fun user experience. Thinglink also has new feature; "touching the image" which resembles the traditional "Facebook like". The aim of this case study was to manipulate our digital strategy in order to make the brand (So Jennie Luxury Bubbles) visible under new key terms and amplify the effect through the use of social platforms. These were chosen among niche key words and concentrated on summer local festivities. Breakthrough was mainly achieved by using alt tags on images and backlinks to sites with strong SEO success. LoungeUp a mobile Hospitality solution to increase profit!